When I was 9 that's what i thought the Byrd's were singing in the Lear Jet song wasn't until i got a set of headphones at 14 i realized they were sing "Come ride the Lear Jet baby" when i think about this i often wonder how many other things in my life went misinterpreted or didn't hear fully the first time around. I enjoyed listening to this. It's kind of like old science fiction from the 50s that is set in the year 1995, yet the televisions all look like old Zeniths. I am shocked and amazed! This very record has been in my needs-to-be-burned pile for about four weeks. Too bad it's after the 1962 expiration date given by Warner Records at the time. Here's a fun tip: If you have an .mp3 editor with automatic cuing, set the dB threshold pretty high and the amount of silence pretty low, and cut these sides into individual phrases and sentences. I used a tool called mp3DirectCut (freeware, google it) and cut Maurice Woodruff into 500 individual tracks between <1 and 11 seconds long. 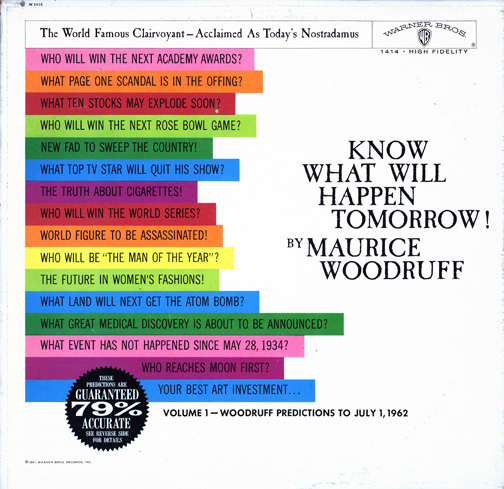 I can play all 500 tracks in random order and have an infinite number of Woodruff predictions: "Who will be man of the year in 1962? It could one of two horses. Can you picture him in a balcony? Expect blood to flow." It also works nicely randomized into my all-music playlist on the iPod, as little bits of spoken word between songs. I pretend he's a robot DJ, so Louis Armstrong's 1929 "King of the Zulus" is introduced: "The time? Spring of 1962." Loads of .mp3 player fun.